Dr. de Barbaro received his MS in physics (1984) from the Jagelonian University (Krakow, Poland) and his PhD in physics (1990) from the University of Rochester. 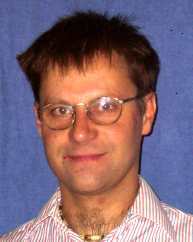 He then continued at Rochester as a postdoctoral associate (1990-1994), was promoted to Senior Research Associate Professor in 1995, and then to Senior Laboratory Engineer and Senior Scientist in 2003. Dr. de Barbaro was an SSC postdoctoral Fellow (1990-1991), served as the Chairman, US-CMS HCAL Institutional Board (2000-2003), and was a CERN Scientific Associate (2003-2004). Since 2003, he has been stationed at the CERN laboratory in Geneva, Switzerland, where he has been serving as the US CMS Installation and Commissioning Coordinator. Dr. de Barbaro's research interests are in the field of experimental high-energy physics. His recent and current and interests include the physics of W's, Z's and Dileptons (CDF and CMSexperiments), electron-nucleon scattering (SLAC E140 experiment) and in neutrino physics (CCFR/NuTeV experiment). In the area of instrumentation, Dr. de Barbaro's research is in the area of scintillating tile/optical-fiber hadron calorimeters. Dr. de Barbaro is currently involved in the CDF and CMS experiments, and is in charge of the running and analysis of the CMS testbeam effort at CERN. He is also in charge of the overall installation of the US contributions to the CMS detector at CERN. For further details, go to Dr. de Barbaro's home page at: http://cms-testbeamh2.web.cern.ch/cms-testbeamh2.